If you are new to creating links in your Surefire Design website editor, you probably need to start by reading ‘Learn to create links step by step’, or check out the online help. If you are confident with copying the URL, selecting the link text, clicking on the chain link button, and pasting the URL into the URL field, then the following extra bells and whistles might be for you! One really useful thing you can do with links is make them open in a pop up window. This is especially important when the link is to someone elses website. The reason is you don’t want visitors clicking on a link to someone elses site, that replaces your site when the new site loads. With the new site opening in a pop up window, your site will still be open in a window behind it! There isn’t much to it. You can make this setting at the time you create the link. Or if the link already exists, right click on it and select Edit Link. This window should look familiar. Click on the Target tab. 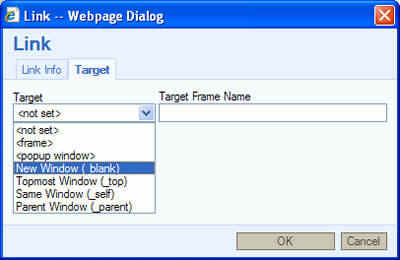 Then from the drop down list, select the one that says New Window (_blank), press Ok and you are done! NOTE You can do the same thing if you have an image that is a link. Just set the target to New Window (_blank). NOTE Another handy link tip, if you have a link you have messed up or want to remove. 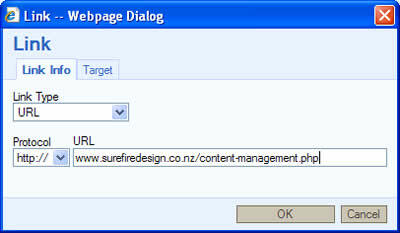 Just right click on the link in the editor and select Remove Link. Simple! Links aren’t as mysterious as they may first seem. b) the address or location the link takes you to. The first step is to browse on the internet to the page you want to link to. This may be a page on your website, or a page on someone elses website. Either way the important thing is that it’s a live page on the internet that anyone can browse to in their web browser. Once you get there all you need to do is copy the web page address from the address bar. Select all of this and copy it (ctrl c or right click and select copy). You can close that website now, as we have what we need. Back in the Surefire Design editor for your website, select (highlight) the text that you are going to make into the text people will click on. Once this text is highlighted, click on the editor toolbar button with the chain link on it. Paste (ctrl v or right click and select paste) the address you copied into the URL field. This will be a live link on your website once you have saved and published. If you want to do more with links, such as making them open in pop up windows etc, check out ‘Cool Advanced Links Features In Your Website Editor’. One other tip, when selecting the text that your visitors will actually click for the link, it is worth making sure this text says something meaningful. Just making the words ‘Click Here’ the whole link doesn’t explain where the visitor will go when they click on it. Whereas making the whole sentence a link ‘Click here to learn more about our new products’, is much more intuitive. This also has some very small benefits when Google comes along to read your content and links, but that is for another article! There are plently of places to learn how to get better results when doing a search on Google, such as including words, excluding certain words, and search only on selected sites etc. Here however are some of the crazy cool ones! * Search “what time is it in New Zealand” – get the time! It even told me the next one along was the Chathams at one hour different! * Search “flight NZ5355″ – this told me it had departed, estimate arrival and how it was 46 minutes late! Normally I fumble around with the airline websites trying to get flight information, not any more! * Try starting your search with “reminds me of” or “sounds like”, to find alternatives you might like in movies and music! * Feeling stuck with the same old same old? If you are looking for software, or that perfect mobile app, try starting your search with “better than” and you might just stumble across a better music player! This one is no secret but still my personal favourite, not sure what a jicama is? Hit that little link in Google for images! I quite often hit the Google images button after doing a text search these days, particularly if the results aren’t obvious to me. It’s amazing what you find.